OMOPO means „One Mankind – One Planet Orchestra“. When people with different backgrounds are making music together, there is a unique magic – a sound fusion of personalities, cultures and ideas creating a united community. Munich is more diverse than ever and at OMOPO, we like to express that in our music – and we’d like you to join us! 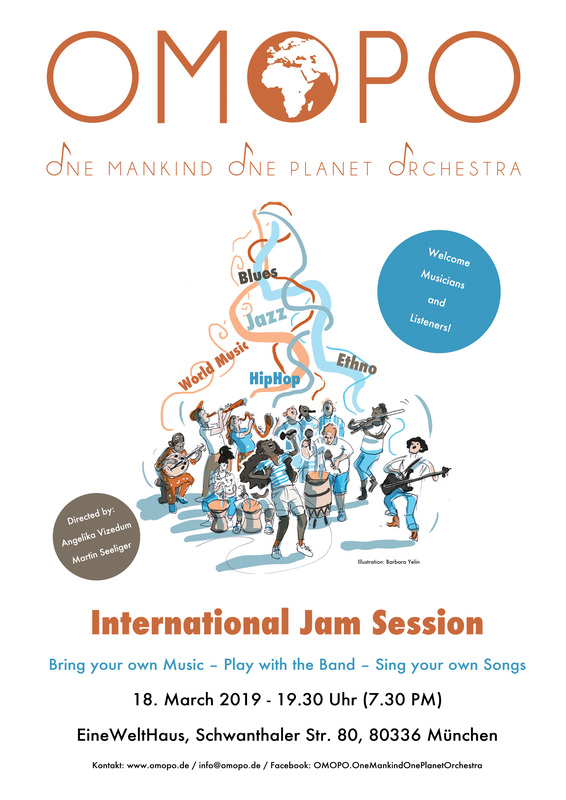 It doesn’t matter what instrument you can play, an Algerian mandole, African percussion, Japanese Koto, Scottish bagpipe, vocals – come and join our international orchestra and let’s create something beautiful! The OMOPO e.V. is a registered Association located in Munich that bears the cost of project as well as the instruments. These are funded entirely through donations. The musical directors of the orchestra are Martin Seeliger (saxophonist, flutist, didgeridoo player, composer, arranger and bandleader) and Angelika Vizedum (singer, percussionist and choir director). Both work at the Music School Grünwald and are freelance teachers (see also www.manymoons.de). The association was founded in the summer of 2015 by Munich businessmen. The idea of OMOPO originated in a Jazz Workshop by Seeliger/Vizedum and is the continuation of a similar project that the two built a few years ago for asylum seekers in Munich that had to be discontinued due to lack of funding. The new association aims to secure long-term financing of the orchestra and also to expand the project if it is successful.